There’s one thing common to all of humanity. Every single one of us is aging. Some of us show the signs of advanced aging sooner than others, some of us look remarkably young even as the birthday cake candles start crowding out the icing. But what about the relationship between aging and hair loss? Many people are concerned about losing hair as they grow older, and they want to know how much aging plays into this. At RHRLI, we know our patients want to know as much as they can about what causes hair loss. We want to give you information about the relationship between hair loss and aging and you should also know that RHRLI has a permanent solution to your thinning hair problems. It’s called the ARTAS® System and it uses advanced robotic technology to conduct the most precise hair transplant you can find. Whatever age you start losing your hair, RHRLI can help. According to the National Institutes of Health (NIH), nearly everyone has some hair loss related to aging. One reason for that is that the rate of hair growth slows as we age. Genetics plays a role in hair growth as well, but the rate of growth and the growth cycle are also critical. There are three phases of the hair growth cycle, according to WebMD. The active phase of the cycle is called the Anagen phase. This is when new hair has grown and is beginning to push hair that’s stopped growing out of the follicle. The next phase is the Catagen or transitional phase and occurs when growth stops and the outer root sheath shrinks and attaches to hair roots, forming what’s called club hair. The final phase is called the Telogen or resting phase this is when club hair is completely formed. 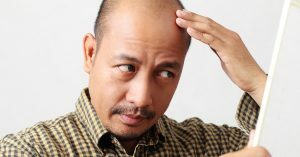 For men, you may see signs of significant hair loss by age 30, possibly earlier. Many men may lose a substantial portion of their hair by age 60. Male pattern hair loss tends to occur by the temples and at the top of the head. Many people don’t realize that hair loss also affects women as they age. According to Oprah.com, 50 percent of postmenopausal women have noticeable thinning of the hair. After age 50, about the same number of men and women show signs of thinning hair. The pattern of hair loss is different for women. Women’s hair loss tends to be most noticeable at the scalp. According to the Huffington Post, it’s normal for women to lose about 100 hairs per day, no matter what your age is, but hormonal changes such as those associated with menopause can affect your rate of hair growth. For both women and men, hair loss can also mean a loss of self confidence. Whether you lose your hair when you’re young or you notice it thinning as you get older, RHRLI knows your hair is often connected to how you feel about yourself. We can get you a great new look with a minimally invasive procedure. Contact RHRLI today.